Do you have outdated processes in your business where you use Excel, Google docs, dysfunctional software or paper-based systems? Let us build you a custom software solution to replace your outdated processes and massively improve the efficiency across your business. I have always had a passion for software development and problem solving. I started OneIT with a vision to combine these two interests. I wanted to offer companies locally in Perth and across Australia, a solution to improving their efficiency and profit while also refining their business processes. I am very proud to say over fifteen years on, we remain committed to this promise and continue to transform the way many businesses work through the delivery of value added, cost effective custom business software solutions. Our prototyping system is a unique tool that allows you to see what the software will look like before you commit. This lets you see how it will work and the benefits clearly and ensures nothing is missed. You should know exactly what you are getting and exactly what you will pay. We give you a fixed cost upfront with no hidden surprises. After investing in software that runs your business, you need a team that will support you over the long haul. With clients who have been with us for over 15 years, we can support you 24x7. We also give you full source code so you are never "locked in", we believe in keeping your business through excellent service and results. Rather than build from scratch, our experience gives us a range of modules that are then specifically tailored to your business. This gives a much more affordable price than building software from scratch. Why not contact us and experience the OneIT difference. Contact us for a free, no obligation discussion about your requirements. Thank-you for contacting us. We will be in touch with you soon. 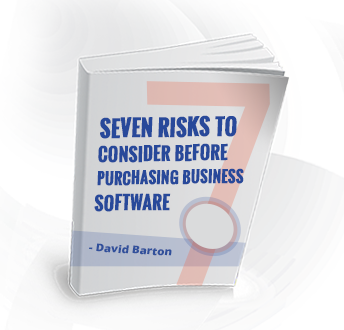 Learn valuable insight from a leading industry expert about the risks to be considered when choosing business software. We value your privacy. Your information will not be shared with any third party.